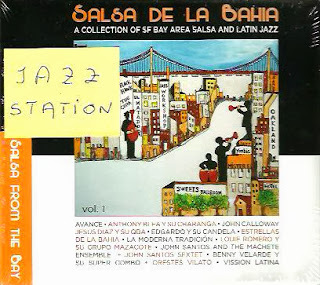 Jazz Station - Arnaldo DeSouteiro's Blog (Jazz, Bossa & Beyond): Latin Jazz CD of the Month - "Salsa De La Bahia"
A groundbreaking anthology of afro-cuban music, "Salsa De La Bahia" reveals the hidden history of tropical heat from the San Francisco Bay Area. A 2-CD companion piece to the upcoming documentary film "The Last Mambo," featuring latin music giants Orestes Vilató, John Santos, Jesus Diaz, John Calloway, and Benny Velarde. Cover and Back Cover Artwork by Pete Escovedo. Rather than dwelling on the reasons why the San Francisco Bay Area’s longtime role as a creative hothouse for Latin jazz and salsa has been overlooked and undervalued for half a century, trombonist/arranger Wayne Wallace and filmmaker Rita Hargraves decided to let the music speak for itself. Released on Wallace’s Patois label, it's a two-CD companion piece to Hargraves’ celebratory documentary "The Last Mambo," which traces the evolution of the Bay Area’s Latin music scene from Cal Tjader, Benny Velarde, and the Escovedo Brothers to present day masters such as John Santos, Jesus Diaz, and Anthony Blea y Su Charanga (with violinist Alfredo De La Fe, who recorded with Manolo Badrena in the 70s). "The Last Mambo" DVD will be released on Patois in spring 2014. More than a historical survey of the singular sounds that have emerged from the Bay Area, the album opens and closes with three thrilling pieces recorded especially for the project by Estrellas De La Bahia, an all-star orchestra encompassing many of the scene’s key players. The package includes extensive liner notes by Jesse “Chuy” Varela, who has incisively chronicled the Bay Area scene for more than three decades as a journalist (JazzTimes, Latin Beat, The San Francisco Chronicle) and DJ and music director for KCSM. The fact that all of the bands featured on the CD are active, save for the Machete Ensemble, speaks to the scene’s vitality. At the same time, all the music, except for the three Estrellas De La Bahia tracks, was originally released on indie labels, which goes a long way toward explaining why so much of it stayed under the national media radar. The album opens with “Canto, Clave y Candela,” a benediction by Edgardo Cambom that serves as a roll call for the album’s guiding spirits. Wallace’s “El Espirtu Del Mambo” provides a vital survey of the scene’s essential voices, with brief, incisive solos by Bahia bandleaders (John Santos and Jesus Diaz) and invaluable sidemen (such as pianist Murray Low, bassist David Belove, and saxophonist Melecio Magdaluyo). The project closes with “Rumba Para Paul,” a beautiful and soulful tribute to the beloved drummer Paul van Wageningen, an integral part of the Bay Area scene for more than three decades until his death in 2012. Part of what makes the Bay Area’s Latin music scene so distinct from New York or Miami is the lack of a Caribbean critical mass. The region received an infusion of Cuban rhythms in the early 1950s via vibraphonist/drummer Cal Tjader, who became fascinated with Cuban grooves as a member of the George Shearing Quintet. When Tjader launched his own Latin jazz band in the early 1950s he ensured a steady flow of top Cuban percussion talent to the Bay Area, most notably masters such as Armando Peraza, Mongo Santamaria, and Willie Bobo. The Panamanian-born percussionist Benny Velarde was present at the creation, recording with Tjader on his classic 1954 Mambo albums for Fantasy. He’s represented here by two tracks with his Su Super Combo. The following generation, who came of age in the 1970s, is vividly captured via tracks by flutist/composer John Calloway and percussionist John Santos, whose improvisation-laced Machete Ensemble embodied the experimental edge of the Bay Area Latin music scene during its two-decade run. With less pressure to stay in fashion, older styles have flourished in the Bay Area. Orquesta la Moderna Tradición, an 11-piece charanga ensemble co-led by Cuban percussionist and dancer Roberto Borrell and violinist Tregar Otton, focuses on stately danzón, a 19th century style that has largely disappeared. But one shouldn’t overstate the divide between the East and West Coast. Before he moved to the Bay Area in 1981 to join Santana, legendary Cuban timbalero Orestes Vilató helped found contemporary New York salsa through his seminal work with the Fania All Stars, Ray Barretto, Ruben Blades, Celia Cruz, and Johnny Pacheco; not to mention Santana and even Annette Peacock. His piece “Toca Vilató” is a tour de force arranged by the great pianist Rebeca Mauleón (who is a shoe-in for inclusion on volume 2), with whom I fall in love after seeing her on the "Latina Familia" video project with Tito Puente, Pete Escovedo & Sheila E. The underrated tenor sax player Justo Almario also shines on this track. A later wave of Latin American artists helped invigorate the Bay Area scene. Cuban percussionists Carlos Caro and Jesus Diaz both brought new rhythmic information directly from the source when the settled near San Francisco. But one vitally important facet that can’t be covered by the CD also helps explain the high level of Latin jazz creativity in the Bay Area, namely a widespread commitment to passing on hard-won knowledge. Many of the players documented on Salsa De La Bahia are influential educators, particularly John Santos, John Calloway, Jesus Diaz, and Wayne Wallace. Only a streak of modesty could have kept Wallace from featuring his own work more prominently, as he could have easily included numerous tracks from his own Grammy-nominated albums. Steeped in jazz and R&B, the trombonist followed his passion for Afro-Caribbean music to Cuba, where he made several trips to study with top players. Over the past three decades, he’s been an essential force on the Bay Area’s Latin music scene through his work as an improviser, arranger, producer, and music director of landmark bands such as Pete Escovedo Orchestra, the Machete Ensemble, and Conjunto Céspedes. His work as an arranger and player is well represented here, but he was determined to make a compelling case for the depth and breadth of creativity on the Bay Area’s Latin music scene.